Marimekko, iittala and more modern Finnish design. 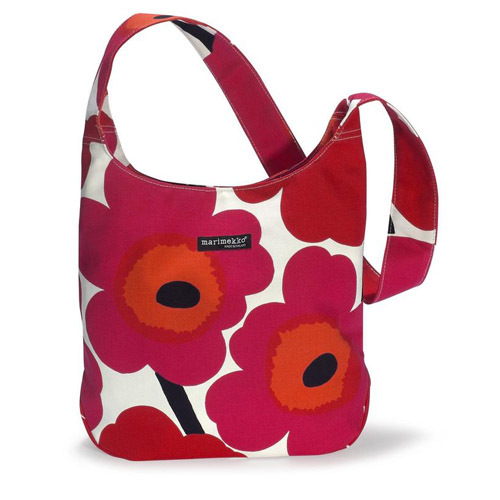 More about Marimekko Unikko Red Clover Bag The Marimekko Clover Bag is perfect for a day at the beach or to port books to class. This versatile accessory has a playful flower pattern splashed across its outer surface. Inside there’s a zippered pocket to facilitate finding all your little necessities and the bag features a magnetic closure to keep your belongings secure. 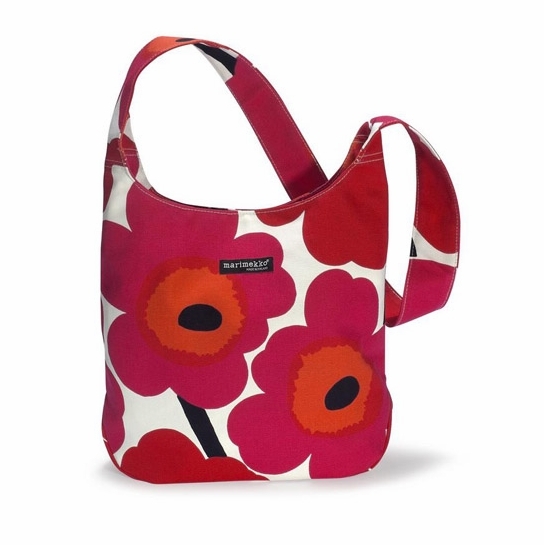 Please note: The print of each bag will slightly vary as the Unikko print has a long repeat. High style and quality bag to use as a purse, carry a tablet or carry your treasures. This Unikko-patterned bag is a classic. I have gotten so many compliments on it! It's such a simple and practical carry-all, but so striking. I have a black one I use in the fall/winter, but I love to break out this fun red one for spring and summer! I wash mine occasionally in the washing machine and let it air dry (be aware that the colors will fade a bit over time; the red especially so). I have had the Clover bag in several colors and handed a couple of my older bags down to my daughters. They cram them full of heavy school books and tote them back and forth every day, yet they've never burst a seam or shown any sign of suffering from the abuse! ProsVery comfortable to carry cross-body, and deceptively well-designed for such a simply constructed bag! ConsExpensive for cotton-printed fabric, and I found that my red Clover bag faded in the wash faster than the other three colors I own. A carefree Summer bag in an iconic Marimekko print,which is well constructed of a sturdy cotton fabric. This is a great casual bag. I don't like to carry a purse on the weekend, when I'm not working, but this bag is convenient and comfortable. It's large enough to carry a few items when I go on an impromptu shop so I don't have to carry a separate bag if I will only have a few small/medium items. The open top means I can carry my 13" Mac Air, but the tall sides means I don't need to worry about it falling out or getting damaged. The print is vibrant and cute - I get complements on it all the time. I would recommend carrying your items inside the purse in a smaller bag that goes in. I had an incident with a pen that didn't have a cap and now I have a small ink stain on the bottom. But if you are looking for a versatile and stylish option for a casual bag, this is a great choice! This is the perfect size purse. It's so cheerful, goes with everything! I am loving this bag!!! It is the perfect size, not too big and not too small! Colour is amazing!!! This is my second purchase and I must say I'm beginning to love your products! This bag is very cute - perfect colors and style for the summer! Got it as a present for my wife - she have not used other bags since she got this. Talkin' about the powerful red bag!!! You go, girl!!! absolutely love this bag!!! It is for a college girl whose birthday is in May,,,i know she will be delighted and surprised. Really like the uniqueness of the design, nice and secure, ain't nobody can have such a pretty bag! Prosread the review...it says it all! Is the strap long enough to wear across your body? Strap Length: 35" (89 cm) I can wear it across my body, yes. Is there a zipper closure on the top of this bag or does it only close with a magnetic closure? This is a magnetic closure bag.